Margaret E. Gruen, DVM, MVPH, PhD, DACVB, is a veterinary behaviorist and an assistant professor of behavioral medicine at North Carolina State University. Dr. Gruen earned her DVM from University of Illinois. Her PhD research focused on pain and behavior in naturally occurring diseases in dogs and cats, and she has spoken widely on topics related to pain, cognition, and behavior problems in pets. Dr. Gruen has particular interest in the interplay between pain and cognitive function. Cognitive dysfunction syndrome is a chronic, progressive disease with a range of clinical signs, including disorientation, changes in social interactions, alterations in sleep–wake cycles, house soiling (in a previously housetrained pet), and changes in activity and learning.1 Cognitive dysfunction syndrome is characterized by neuronal loss and neuroaxonal degeneration.2 The neuroanatomic pathology in dogs and cats shares some characteristics with human Alzheimer’s disease,3,4 specifically β-amyloid accumulation, tau phosphorylation, and neuronal loss in the frontal cortex, cerebellum, and hippocampus.2,5-7 The most common signs of cognitive dysfunction syndrome in dogs include house soiling and an increase or decrease in social interactions8; the most common signs in cats include vocalization and house soiling.9 Both dogs and cats may show signs of anxiety or fear (eg, agitation), which may be a result of disorientation. These clinical signs, particularly being awake at night, can be detrimental to the human–animal bond. Older dogs and cats should be screened for cognitive dysfunction syndrome at annual visits and pet owners educated about the common signs. Environmental enrichment, mental stimulation, and diet promote cognitive health as pets age. Therapeutics used to treat cognitive dysfunction syndrome are typically chosen to address clinical signs once they have been detected. 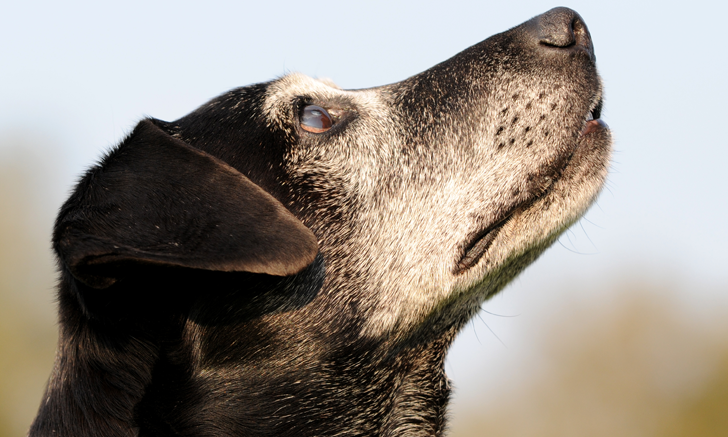 There are no approved drugs for prevention of cognitive dysfunction syndrome, and only one drug has been approved for dogs.10 Use of drugs to provide supportive and complementary care can mitigate signs associated with cognitive dysfunction syndrome. Clinician understanding of the rationale and utility of available drugs is crucial, as is balancing medications, owner expectations, and potential drug interactions. Drug decisions should be based on clinical presentation, and patients should be monitored for treatment efficacy. It can be useful to prioritize the presenting signs to address those most pressing; for example, anxiety and changes to the sleep–wake cycle are often addressed first. Improvement or stabilization of clinical signs may take 6 to 8 weeks. Concurrent use of selegiline with other MAOIs (eg, amitraz) or serotonergic drugs (eg, selective serotonin reuptake inhibitors, tramadol, trazodone) is contraindicated due to increased risk for serotonin syndrome. In older humans, benzodiazepines may be associated with postoperative cognitive decline and an increased risk for Alzheimer’s disease.17 However, the disease risk in humans increases with both length of treatment and half-life of the medication,18 and relevance in animals is unknown. Benzodiazepines may be useful in treating anxiety and agitation associated with cognitive decline in humans and may be helpful in treating this condition in dogs. Although a variety of benzodiazepines are widely available, those with a shorter half-life and no active metabolites are preferred. Lorazepam is a generally well tolerated benzodiazepine with no active metabolites. Its elimination half-life in dogs is approximately an hour. Side effects can include lethargy or idiosyncratic increases in activity or vocalization. Lorazepam may be beneficial at night for patients that exhibit night waking. Various nutraceuticals have been used to treat cognitive dysfunction syndrome. The following discussion is limited to those that have been studied in dogs or cats. α-casozepine is a decapeptide derived from α S1-casein in milk. Though the mechanism of action is not completely understood, α-casozepine appears to be structurally similar to γ-aminobutyric acid. It has been studied primarily for efficacy in anxiety paradigms in cats and dogs19,20; in dogs, however, it was evaluated for equivalence against selegiline.20 α-casozepine may be useful in alleviating signs of anxiety that accompany cognitive dysfunction syndrome. α-casozepine has not been evaluated for use in treating cognitive dysfunction syndrome, but it may be useful for treating comorbid anxiety. Dose (dogs) → See package insert. Dose (dogs, cats) → See package insert. Apoaequorin has not been evaluated for beneficial effects in cats but is available in a sprinkles formulation. *Of note, the commercial product has been placed on indefinite backorder. Landsberg G, Hunthausen W, Ackerman L. The effects of aging on behavior in senior pets. In: Landsberg G, Hunthausen W, Ackerman L. Behavior Problems of the Dog and Cat. 3rd ed. Philadelphia, PA: Elsevier Saunders; 2013:211-236. Head E. Neurobiology of the aging dog. Age (Dordr). 2011;33(3):485-496. Cummings BJ, Head E, Afagh AJ, Milgram NW, Cotman CW. Beta-amyloid accumulation correlates with cognitive dysfunction in the aged canine. Neurobiol Learn Mem. 1996;66(1):11-23. Bosch MN, Pugliese M, Gimeno-Bayón J, Rodríguez MJ, Mahy N. Dogs with cognitive dysfunction syndrome: a natural model of Alzheimer’s disease. Cur Alzheimer Res. 2012;9(3):298-314. Zhang C, Hua T, Zhu Z, Luo X. Age-related changes of structures in cerebellar cortex of cat. J Biosci. 2006;31(1):55-60. Zhang C, Zhu Q, Hua T. Effects of ageing on dendritic arborizations, dendritic spines and somatic configurations of cerebellar Purkinje cells of old cat. Pak J Zool. 2011;43(6):1191-1196. Chambers JK, Tokuda T, Uchida K, et al. The domestic cat as a natural animal model of Alzheimer’s disease. Acta Neuropathol Com. 2015;3:78. Azkona G, García-Belenguer S, Chacón G, Rosado B, León M, Palacio J. Prevalence and risk factors of behavioural changes associated with age-related cognitive impairment in geriatric dogs. J Small Anim Pract. 2009;50(2):87-91. Landsberg GM, Deporter T, Araujo J. Clinical signs and management of anxiety, sleeplessness, and cognitive dysfunction in the senior pet. Vet Clin North Am Small Anim Pract. 2011;41(3):565-590. U.S. Food & Drug Administration. Application number 141-080 (Anipryl). US FDA website. https://animaldrugsatfda.fda.gov/adafda/views/#/home/previewsearch/141-080. Accessed November 6, 2018. Landsberg G. Therapeutic options for cognitive decline in senior pets. J Am Anim Hosp Assoc. 2006;42(6):407-413. Knoll J. (L-)Deprenyl (selegiline), a catecholaminergic activity enhancer (CAE) substance acting in the brain. Pharmacol Toxicol. 1998;82(2):57-66. Ruehl WW, Bruyette DS, DePaoli A, et al. Canine cognitive dysfunction as a model for human age-related cognitive decline, dementia and Alzheimer’s disease: clinical presentation, cognitive testing, pathology and response to 1-deprenyl therapy. Prog Brain Res. 1995;106:217-225. Head E, Hartley J, Kameka AM, et al. The effects of L-deprenyl on spatial short term memory in young and aged dogs. Prog Neuropsychopharmacol Biol Psychiatry. 1996;20(3):515-530. Mills D, Ledger R. The effects of oral selegiline hydrochloride on learning and training in the dog: a psychobiological interpretation. Prog Neuropsychopharmacol Biol Psychiatry. 2001;25(8):1597-1613. Anipryl [package insert]. Kalamazoo, MI: Zoetis; 2013. Defrancesco M, Marksteiner J, Fleischhacker WW, Blasko I. Use of benzodiazepines in Alzheimer’s disease: a systematic review of literature. Int J Neuropsychopharmacol. 2015;18(10):pyv055. Bégaud B, de Gage SB. Benzodiazepine use and risk of Alzheimer’s disease: case-control study. BMJ. 2014;349:g5025. Beata C, Beaumont-Graff E, Coll V, et al. Effect of alpha-casozepine (Zylkene) on anxiety in cats. J Vet Behav Clin Appl Res. 2007;2(2):40-46. Beata C, Beaumont-Graff E, Diaz C, et al. Effects of alpha-casozepine (Zylkene) versus selegiline hydrochloride (Selgian, Anipryl) on anxiety disorders in dogs. J Vet Behav Clin Appl Res. 2007;2(5):175-183. Osella MC, Re G, Odore R, et al. Canine cognitive dysfunction syndrome: prevalence, clinical signs and treatment with a neuroprotective nutraceutical. Appl Anim Behav Sci. 2007;105(4):297-310. Heath SE, Barabas S, Craze PG. Nutritional supplementation in cases of canine cognitive dysfunction—a clinical trial. Appl Anim Behav Sci. 2007;105(4):284-296. Sharma A, Gerbarg P, Bottiglieri T, et al. S-adenosylmethionine (SAMe) for neuropsychiatric disorders: a clinician-oriented review of research. J Clin Psychiatry. 2017;78(6):e656-e667. Araujo JA, Faubert ML, Brooks ML, Landsberg GM, Lobprise H. NOVIFIT (NoviSAMe) tablets improve executive function in aged dogs and cats: implications for treatment of cognitive dysfunction syndrome. Intern J Appl Res Vet Med. 2012;10(1):90-98. Milgram NW, Landsberg G, Merrick D, Underwood MY. A novel mechanism for cognitive enhancement in aged dogs with the use of a calcium-buffering protein. J Vet Behav Clin Appl Res. 2015;10(3):217-222. Siwak CT, Gruet P, Woehrlé F, Muggenburg BA, Murphey HL, Milgram NW. Comparison of the effects of adrafinil, propentofylline, and nicergoline on behavior in aged dogs. Am J Vet Res. 2000;61(11):1410-1414. Milgram NW, Zicker SC, Head E, et al. Dietary enrichment counteracts age-associated cognitive dysfunction in canines. Neurobiol Aging. 2002;23(5):737-745. Landsberg G, Pan Y, Mougeot I, et al. Efficacy of a therapeutic diet on dogs with signs of cognitive dysfunction syndrome. In: Proceedings of the 11th International Veterinary Behaviour Meeting. 2017;114. Pan Y, Kennedy AD, Jönsson TJ, Milgram NW. Cognitive enhancement in old dogs from dietary supplementation with a nutrient blend containing arginine, antioxidants, B vitamins, and fish oil. Br J Nutr. 2018;119(3):349-358. Pan Y, Araujo JA, Burrows J, et al. Cognitive enhancement in middle-aged and old cats with dietary supplementation with a nutrient blend containing fish oil, B vitamins, antioxidants, and arginine. Br J Nutr. 2013;110(1):40-49.